How much are your habits costing you? A great exercise to do to find out is to track how much you spend on certain habits daily, weekly, monthly, and annually. The results might surprise you! Habits take a while to develop and often become a part of your regular routine. If you’re trying to reach a specific financial goal, it may be smart to cut out or reduce some costly habits. It’s easier to cut out bad habits, or those that aren’t healthy, or those that don’t add value to your life. So, I’d suggest starting with those first. To help you brainstorm, here are 7 habits you can give up to save more money. Sure, outsourcing can be helpful in helping you save time or maybe even money. However, you can take things too far if you start depending on other people to do everything for you. If you’re going to outsource everything, that likely means you don’t know how to do much on your own or aren’t managing your time as efficiently. It’s important to only outsource a few select things that can truly provide ROI and still know how to do some things on your own. For example, no matter how much money I get, I’m still going to cook for myself 90% of the time and avoid dining out or take out. My husband and I want to grow our skill sets to become more efficient in most areas of our lives so we only outsource when it makes the sense. I haven’t done this in a while, but I know some people still find retail therapy very important. How is this helping your wallet though? Probably not at all. Try to get into the habit of planning your shopping trips for specific purposes as opposed to just going to the mall one weekend because you’re bored. You can find much cheaper hobbies for enjoyment that aren’t going to cause you to have a house full of stuff. Smokers and non-smokers alike know that it’s a costly habit and addiction. It’s also bad for your health and the environment. If you smoke a pack a day, you’re likely to spend $177 a week on cigarettes, which is over $9,200 each year. Imagine what you could do with an extra $9,000 per year. You could pay off all your debt, take 1-2 really nice vacations each year, or start investing more money and possibly retire earlier than you thought. Plus, you’ll be lowering the risks of having serious costly medical issues when you get older. There’s nothing wrong with buying coffee in my opinion. I personally feel like everything should be done in moderation. I’m not a heavy coffee drinker so I don’t go to Starbucks daily, weekly, or even monthly at times. However, over the summer I have learned that fruit smoothies are my guilty pleasure. I love the fresh bubble smoothies that are usually $4 – $5 each. Like buying coffee, it’s an expensive habit that adds up over time. Even though it adds to my happiness, I cut out the habit of making those ‘small’ purchases regularly. Now, it’s just a treat I have every now and then and I’m content with that. For coffee drinkers, one of the best things you can do is invest in a quality coffee maker and make your own coffee at home or drink coffee at your workplace if they provide it. My husband drinks more coffee than I do, so I found a Keurig for $35 on the Facebook marketplace which was a great deal. The seller was very friendly and even gave us all her leftover unused Keurig cups so we haven’t had to buy coffee for a while now. This may seem like a harmless habit, but it’s practically the same as taking your hard earned money and throwing it in the garbage. Most of us (myself-included) have been guilty of tossing out leftovers or having food waste. To ditch this habit, you can start planning your meals out and try to make new recipes with leftover meals or miscellaneous items in your fridge. Nine times out 10, I can make a delicious soup with food items in my fridge that I don’t want to go bad. My family won’t eat leftovers two days in a row so if I still have extra food I need to get rid of, I repurpose it make a brand new meal. We’ve discovered a lot of new recipes we have come to love with this technique. Gambling is another habit you might want to slow down on. I’m not saying end your tradition of going to Vegas every year and hitting up the casinos, but if you gamble regularly, you’re bound to lose money. I don’t know anyone who gambles often and is able to support themselves and their family from the money. Gambling is more of a game and it’s very uncertain if you’ll win money and how much you’ll win. The one thing that’s for certain is that you’ll spend money playing the games. It’s not uncommon to develop a gambling addiction or lose large amounts of money if you stick with this habit. If you always pull your credit card out of your wallet when making an unplanned or everyday purchase, it’s likely that you will lose money in the long run. Using your credit card as back-up money is not a good idea because it’s unlikely that you’re going to be able to pay off your bill in full if you didn’t budget for the purchase in the first place. Keeping a balance means you’ll have to pay interest and credit card interest rates are high. Credit cards should be used as a tool to improve your credit score. If you can start using them wisely by planning out your purchases in order to pay off the bill in full each month, you’ll avoid interest charges and save a lot of money. Do you need to give up any of these habits? 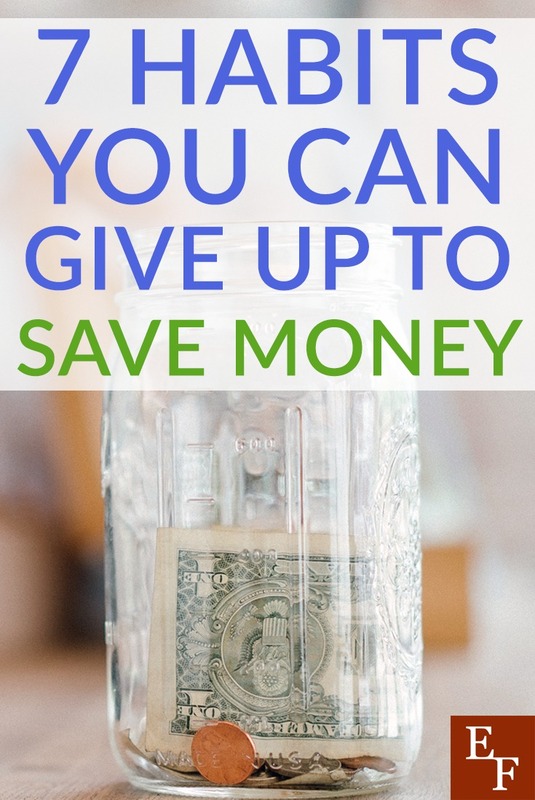 How much do you think you could save by doing so?